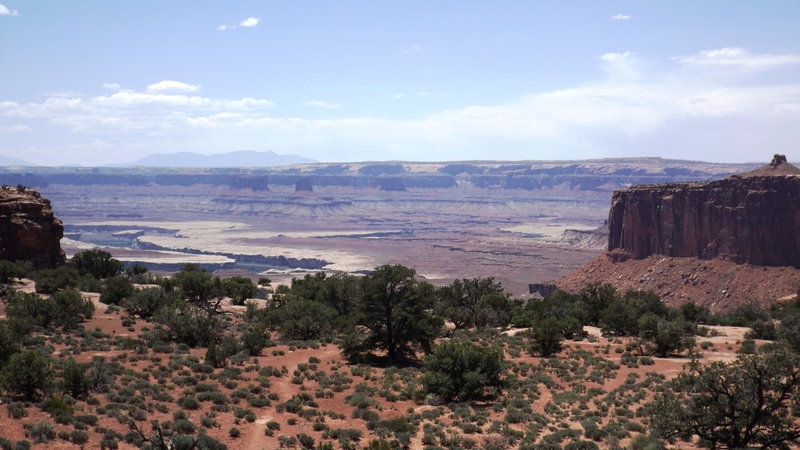 One can camp near Moab and see both Arches and Canyonlands NP’s from the same base of operations. We did just that, and I found Canyonlands quite interesting. For one thing, you see most of it from above, just like in Grand Canyon. The park lacks shuttles, but one third of it is highly accessible from your car. That would be the section known as “Island in the Sky”. 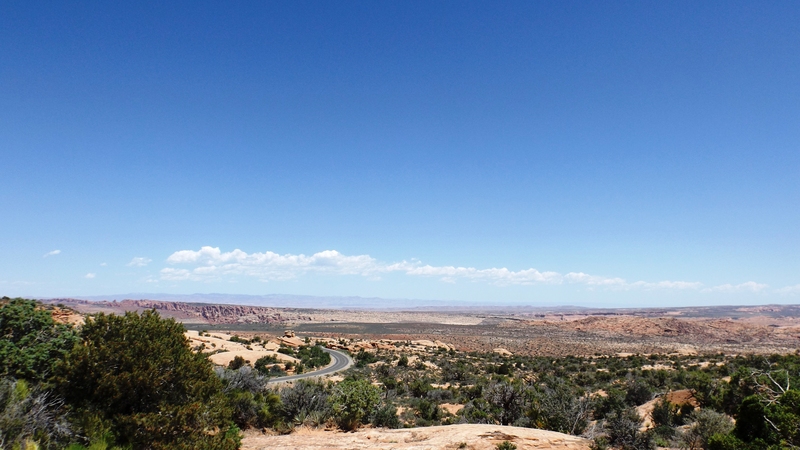 It’s about 30 miles out of Moab and about 7,500 feet up. We saw photos of the island with clouds below it, but in a Moab summer, you ain’t never gonna see that. Still, the air is wonderfully clear, and it was easy to see mountains nearly 100 miles away. 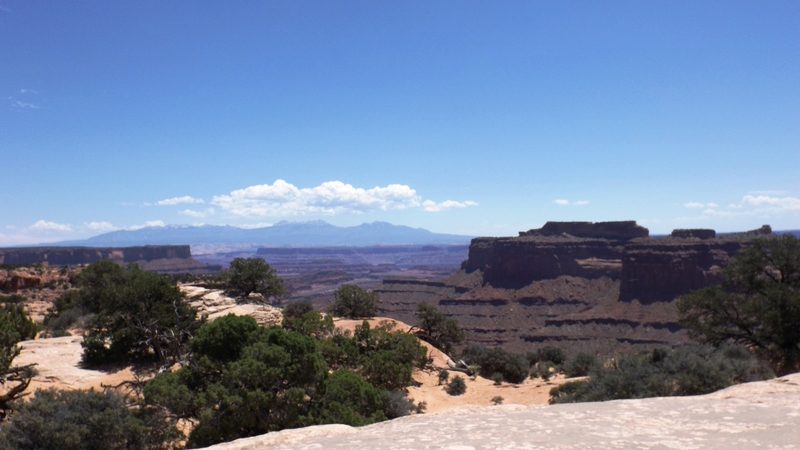 Canyonlands consists of real canyons carved over millions of years by the Colorado and Green Rivers. Some of them are spectacular and about 500 million years of geological time are on display. 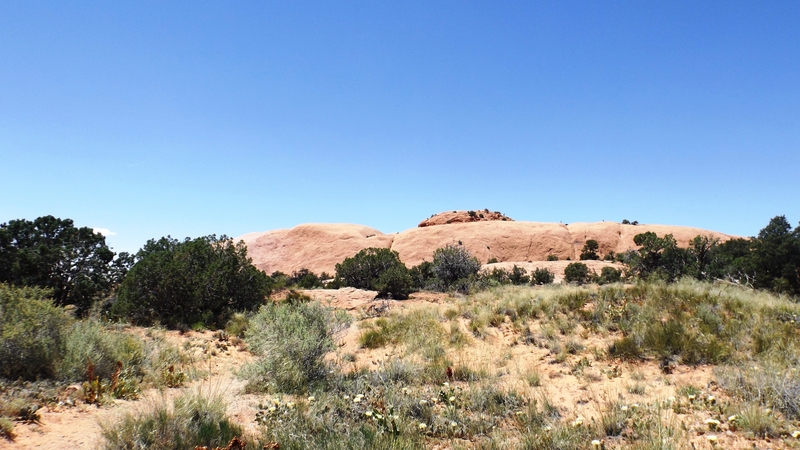 If you go to Arches you must spend half a day visiting the Island in the Sky. If you have good knees, a lot of time, and are feeling adventurous, you should drive an extra 100 miles to see Newspaper Rock (pictographs are all over the place!) and plan a long hike into the dry and dangerous Maze section of the park. I’m too old and shaky on my pins for such things, but you will be utterly alone and forced to confront nature up close and personal at nearly every turn in The Maze. We learned about The Maze in the Visitor Center’s introductory film, and then learned some more from a bartender in Durango, our next stop after Moab. He shared some other tales with us, but since nearly everybody in Durango has his own tarot reader, acupuncturist, life coach, and herbal wellness advisor … I am inclined to take his words with a spoon of salt. Then again, if you believe in ghosts, voodoo, or anything that cannot be predicted mathematically, you and I must heed his words. So do I. But I never find arrowheads or Clovis spear points. I guess that makes the discussion purely academic. History, humor, and stunning photographs! Even though I don’t say “yay” after each one, I really like them. Yo, it’s like church. The man don’t ask for every dollar; just one dime out of every dollar. Read ten and like one. That’s about how often we do something semi remarkable. 1 out of 10. That keeps you in Very Good Standing.